I couldn't sleep last night after reading this revolting story about members of the "Tea Party" staging a revolt and turning Kansas blue. According to some lady writing a story about Kansas from her cozy home in Washington D.C., Kansas Tea Party members are "negotiating" with members of the Roberts and Brownback campaigns. Here's one of many money quotes: "It all comes back to whether or not there's an agreement reached. I don't know if there's going to be," said Steve Shute, a city councilman in Gardner, Kan., and Tea Party activist. "The longer this delays, to find results, the greater risk there is that Kansas turns blue or purple," said Shute, who's been acting as a moderator between conservatives and the campaigns of Roberts and Kansas Gov. Sam Brownback. It's hard for me to find the right words to explain how blood-ragingly angry that quote makes me. Lucky you all, I'm going to try. First, in order to "negotiate" anything you have to have something the other party wants. I'm assuming Shute believes he can lead Tea Party conservatives to the Roberts and Brownback stream and make them drink. That idea is the single most egotistical load of hubris on planet Earth today, and it shows a stunning lack of understanding of what the Tea Party is all about. Memo to all would-be Tea Party self-proclaimed spokespeople: You don't speak for me. You don't speak for the majority of us. The Tea Party was an organic, grassroots effort founded largely on liberty, personal responsibility and fiscal restraint. When it began, there were no leaders. And honestly today, the Tea Party is an idea -- not a political party, though plenty of people have worked long and hard at trying to hijack it for their own personal gains. Shame on them. If you want to get dressed up in your Revolutionary War garb and give speeches about patriotism, go ahead. But please know your comments are yours alone. You do not speak for the Tea Party. You do not speak for conservatives. 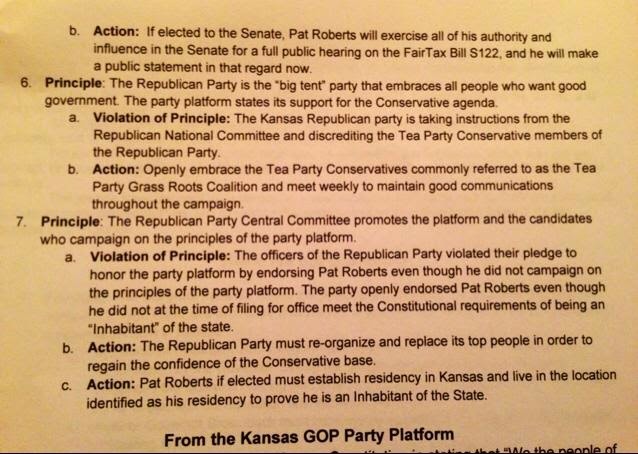 Word on the street here in actual Kansas is that a meeting did take place at the behest of Sen. Roberts, who hoped to learn how to reach some of the "tea partiers." I appreciate the good faith effort from Sen. Roberts, but please, do your homework! Those people don't speak for anyone but themselves. Further, never, EVER, allow people into such a meeting that can't stop themselves from running to the press. There were people I respect in that meeting. They are not quoted in the article. The mere appearance of attempting to negotiate with those lunatics is damaging to the Roberts campaign, and probably to the Brownback campaign as well. As soon as the list of "demands" was brought to the table, the sane people should have refused to continue the discussion. There's simply no reason to negotiate with a person who holds little, if any, political clout, and even less of a reason to have a discussion with someone making outrageous demands. Their demands are truly insane and damage the conservative cause. According to the article in The Hill, the deranged self-proclaimed leaders are asking that Anne Hodgdon be removed from her slot on the Kansas Board of Healing Arts. Hodgdon, you'll recall, is a vocal Roberts supporter. Gov. Brownback appointed her to the board, and the board began investigating an ethics complaint about Milton Wolf and his x-rays. What a bunch of hypocrites the so-called "Tea Party" activists are if they attempt to use their self-perceived power to target a private citizen, which Hodgdon is. 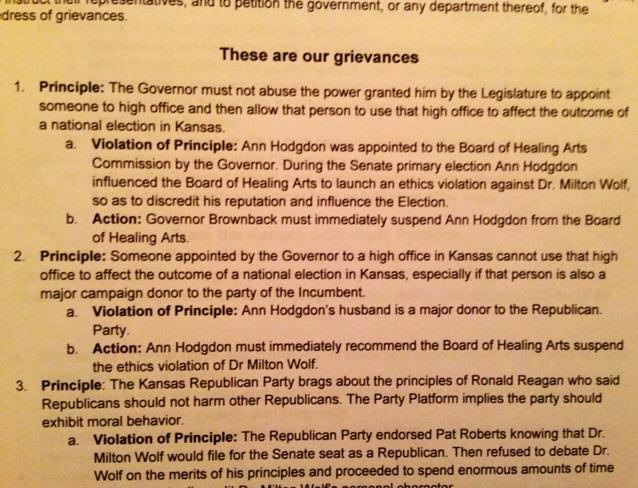 Ironically, they are demanding that Brownback do to Hodgdon what they said Hodgdon did to Wolf -- that is abuse power. It's hideous. Their second demand is just as ludicrous. This drum circle of raging idiots told The Hill that they are also demanding that the state party "adopt a resolution declaring that if Roberts doesn't complete all six years of his next term, Wolf would be named his replacement." I have two major problems with that demand. Um. That's not how that works. That's not how any of that works, and secondly, it's politically daft to let the whole world know that Roberts likely isn't going to complete his term right BEFORE a hotly contested election. If and when there is a Republican vacancy in office, precinct committee men and women select a replacement. Precinct people are the grassroots. They are duly elected by their friends and neighbors and they are tasked with doing the crappy groundwork in campaigns. When someone comes to your door with political literature and a yard sign, chances are they serve as precinct people. That's their real job. Every once in a blue moon, they get the small perk of choosing a replacement office holder. So, if Roberts is elected and for some reason he doesn't serve out the remainder of his term, grassroots people will select his replacement via a ballot. Wolf is welcome to try for the opening, but that's not how it works that the state party can just name a successor. Have these activists lost their minds? Allowing the state party to say in advance who a successor would be is a terrible idea that places even more power in the hands of the state party. I don't think that's very "tea party" of them. Look, insiders (and wannabes) all know that Roberts, if he manages to win, isn't staying in office the entire term. And I know I've said this somewhere before but am too lazy and enraged to seek it: I think that's gross and tacky and indecent. But that's the system we have, and like a good, actual Tea Partier, I like to follow the rules, until we change the rules. And by changing the rules, I mean we do it through the appropriate channels -- not by acting like political hacks with an axe to grind. I don't want to leave any room for doubt here, so I'm going to reiterate a few things: Shute, Rob Wood and Chuck Henderson don't speak for me, and I'm certain they don't speak for most others. Every Wolf voter that I personally know has come to terms with voting for Roberts. They will do what they should. There are approximately five leftover holdouts from the Wolf campaign. And as evidenced by that story in The Hill, they are lunatics. No one is taking political cues from them. They have been denounced thoroughly from every corner of the state. All of that said, if anyone from the Brownback or Roberts campaign actually meets with those fools, they should do no more than offer a pat on the head and a piece of candy. They are not to be taken seriously. For what it's worth, here are there supposed demands in outline form. On Twitter, @sunflowrpatriot IS Milton Wolf. That's right, "the next Ted Cruz" has resorted to tweeting from a troll account. Now that you know this, go back and read his tweets and tell me you aren't more disgusted with his level of narcissism. Milt told his followers to follow that twitter account. I've never seen him tell anyone to follow any other twitter account, even the one for his loony sister-in-law. But interesting that all of the latest tweets from that account are whining about people who criticize Milt. He must be one gigantic pansy. Why is it the Fair Tax crowd so obsessed with Milton Wolf? He ran a horrible campaign, never, ever said what he stood for and just said Roberts is old and lives in Virginia over and over. He lost, fair and square, get over it. You rant about "Tea Party demands", yet the document you offer as evidence does not contain the words "Tea", "Party" or "demands" in any combination, anywhere. They appear to resemble nothing so much as a list of "Grievances", "Principles" and proposed "Actions", which are more like really, really strong suggestions than anything so sinister as "Demands". Perhaps the missing words are found off the edge of the obviously cropped images? Maybe this will clear up your confusion. 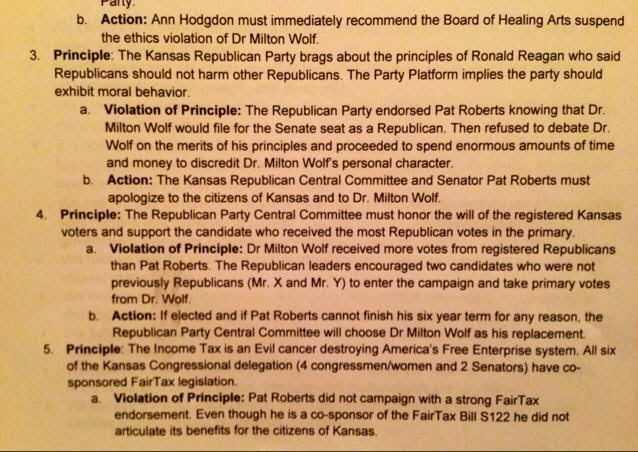 "In large part, the Tea Party’s demands center on the investigation launched by a Kansas medical ethics board into Wolf’s controversial postings of patient X-Rays and off-color commentary to his Facebook page, which helped sink his campaign when the details of the posts and the investigation were leaked to the press." "Shute declined to confirm the parameters of the demands from conservatives, but conversations with members of both wings of the party indicate that they include, but aren’t limited to, Brownback intervening to dismiss the ethics investigation into Wolf." Anne Hodgdon is not a private citizen. She should be fired. Doctors are mad at her. Kansas GOP leaders know she's behind the wolf pack investigation and Brownback is concerned she'll hurt his reelection. She embarrassed the state and governor. You're right they all look bad. Brownback, Roberts, Wolfies, Clay Barker. Fools and halfwits. All of 'em. And I would never want my name mentioned in the same breath as Steve Shute. He's a douche.